CX Partners-backed restaurant chain Barbeque Nation Hospitality Ltd on Monday filed a draft red herring prospectus with the Securities and Exchange Board of India for a public listing. The offer comprises a fresh issue of shares worth Rs 200 crore besides a secondary market offering of 6.18 million shares by promoter and managing director Kayum Dhanani, certain members of the Dhanani family and private equity backer CX Partners. Home-grown CX Partners will sell a bulk of its holding in the company, as per the DRHP. The public offer will result in a 31-32% stake dilution on a post-offer basis. The issue size is estimated at Rs 700 crore ($109 million), said two persons familiar with the development. A third person familiar with the development, however, pegged the issue size at as much as 900 crore ($140 million). The public offering will value the Bengaluru-based restaurant chain at Rs 2,000-2,200 crore, as per VCCircle estimates. Last year, VCCircle reported about the company’s plans to go for an IPO. In March 2017, VCCircle also reported that Barbeque Nation had appointed merchant bankers for the IPO. 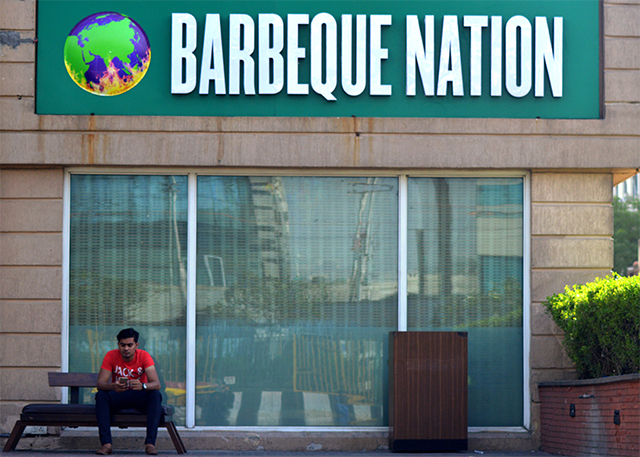 Barbeque Nation’s IPO will become the first public offering by a restaurant chain in more than five years. SAIF Partners-backed fine dining chain operator Speciality Restaurants Ltd, which also runs 62 food & beverages outlets in India, including popular brands such as Mainland China, Oh! Calcutta and Sweet Bengal, went public in May 2012. Kolkata-based Speciality Restaurants had mobilised over Rs 175 crore and joined other listed peers such as Domino’s Pizza India licensee-Jubilant Foodworks Ltd and McDonalds India licensee- Hardcastle Restaurants Pvt. Ltd. The issue size is estimated at Rs 700-900 crore ($109-140 million). This will result in 31-32% stake dilution on a post-offer basis. The IPO will value the restaurant chain at Rs 2,000-2,200 crore. The company will use Rs 68.54 crore of the net proceeds to set up new Barbeque Nation restaurants in India, Rs 85 crore towards repayment and pre-payment of loans by the company and its subsidiaries besides using a portion for general corporation purposes. The proceeds from secondary sale will go to the selling shareholders. IIFL Holdings, Edelweiss Financial Services, Jefferies India and SBI Capital Markets are merchant bankers to the IPO. The company has hired Cyril Amarchand Mangaldas as the legal counsel in the IPO process. The merchant bankers have appointed S&R Associates and Herbert Smith Freehills LLP as their domestic and international legal advisers, respectively, on the IPO. The restaurant chain was founded in 2006 and had 81 outlets across the country as on 31 March 2017, according to the DRHP. Besides, it has one restaurant in Dubai and has also granted franchise rights for one of its Barbeque Nation restaurants. It offers cuisines including Mediterranean, American, Asian and Indian, and also allows customers a hand in cooking their own food through its ‘Do-It-Yourself’ concept. The casual-dining chain is an associate firm of Mumbai-listed hospitality firm Sayaji Hotels Ltd. It is known for do-it-yourself cuisine with a concept of live on-the-table grill, and offers Mediterranean, American, Oriental, Asian and Indian food across 62 outlets in the country. Tarun Khanna, a partner at Barbeque Nation’s private equity investor CX Partners, told in a VCCircle interview that an IPO will likely happen in December 2017. VCCircle reported in May 2016 that BNHL charted out a new growth plan through acquisitions as it simultaneously prepared to float an IPO. VCCircle reported in September 2016 that the company acquired the master franchise rights for American burger chain Johnny Rockets in India in an all-cash deal. BNHL paid Rs 17 crore ($2.5 million) to buy the entire business of Johnny Rockets from Prime Gourmet. The Johnny Rockets deal will help BNHL add a quick service restaurant (QSR) format to its portfolio and boost its operations in Delhi-NCR. The company is aiming to strike some other deals ahead of its listing. BNHL reported consolidated net profit of Rs 9.93 crore for FY2016-17 on revenue (from operations) of Rs 496.65 crore. Its revenue stood at Rs 397.64 crore in FY2015-16 and Rs 298.74 crore in the previous year. The company’s net profit growth slowed by 14.18% over the previous two years. Its net profit stood at Rs 5.88 crore in FY2015-16 and Rs 13.49 crore in FY2014-15. For CX Partners, BNHL will be the third portfolio firm from which it is looking to exit via a public float. The PE firm had invested Rs 110 crore in BNHL in 2013 followed by an additional Rs 103 crore-investment in 2015. Last year, the IPO of another CX Partners portfolio firm Thyrocare Technologies Ltd was subscribed 72 times in what was the second-best public issue in eight years in terms of investor interest. The PE firm’s portfolio company Security and Intelligence Services (India) Ltd listed on stock exchanges last week with a 7% decline on debut day. International SIM provider Matrix Cellular is another CX Partners-backed firm that was looking to sell its shares on public markets though it has postponed the issue till the second or third quarter of next year. In early 2016, CX Partners exited outsourcing services provider Minacs when it was sold to Synnex Corp for $420 million. Meanwhile, CX Partners last year hit the market for its second sector-agnostic fund.